Good News for those who speak Hindi. Google just released the new Google Hindi Input app that allows you to type messages, updates on social networks or compose emails in Hindi on your Android phone. If you can read नमस्ते correctly on your phone, then you may install and use Google Hindi Input, otherwise your phone may not support Hindi. This is the second biggest news from Google for Indian users. First they enable books in Play Store and now Hindi Input app. Hindi is the national language in India and most of the people write & speak only in Hindi. 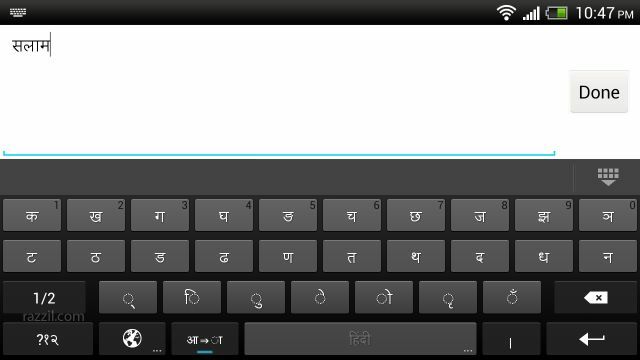 In the transliteration mode, you can type Hindi word in English characters and the app will convert them into Hindi. For example, type “hindi” and then you will get the word हिंदी from a list. By turning off the transliteration mode on an English keyboard, you can type in English. You’ve to enable ‘Google Hindi Input’ from Language & keyboard settings and after that you can type in Hindi. The app requires Android 2.2 and up and can be downloaded free from below widget.